One of the most effective ways to control noxious weeds is through Integrated Pest Management (IPM), a system by which one or more techniques are brought together to create management plan for the land owner to address their specific needs and challenges. An IPM can provide optimum control of weeds, however, it doesn’t mean that multiple techniques have to be used, nor does it mean chemical control options can never be used. Contact Us if you would like assistance in creating your IPM plan. Clean equipment, vehicles, clothing and shoes when leaving a known infected area and before entering a non-infected area. Contain animals who have grazed in infected areas for 2 weeks in a dry lot, before moving them to grazing areas not infested. Manage existing vegetation wisely – Do not overgraze grasses to the point they struggle to compete with weeds. 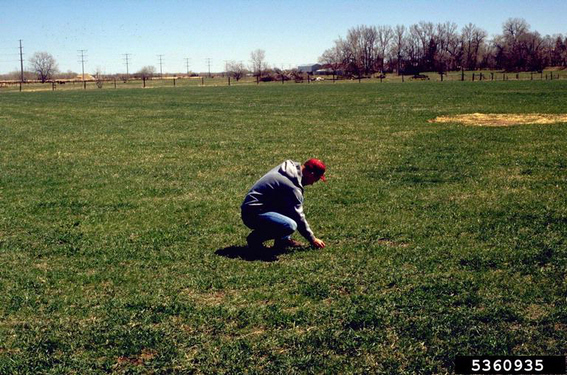 Minimize soil disturbances which encourage the germination of weed seeds. Use weed-free sand, soil and gravel for projects. Monitor regularly to detect and implement control of new infestations early. Support existing competitive vegetation through fertilization, irrigation, re-seeding. Establish competitive vegetation, such as grasses and forbs, which often compete well with weeds in most cases. The use of insects, diseases or grazing animals can be used in large, heavily infested areas, though these methods are not desirable when eradication is the goal. Biological techniques are often used to reduce the dominance of noxious weeds. Herbicides suppress or kill weeds by disrupting the biochemical process unique to certain plants. To control infestations, start at the outer edges and work inward; always monitor roadsides, railways and waterways. View the Most Common Noxious Weeds for our area.